For a good part of my life I echoed Indiana Jones whenever I encountered snakes. My less-than-friendly feelings toward snakes started in ninth grade, when a classmate presented an oral report on their care and feeding, including a demonstration involving his pet snake and a live (for a short time) white mouse. After I crawled out from under my desk, I decided I was very fond of rodents and not at all fond of snakes. I also decided I no longer had a crush on the young man who did the presentation. Twenty years later, when my daughter held a snake at a petting zoo, I decided it was time to get over my distrust of snakes. 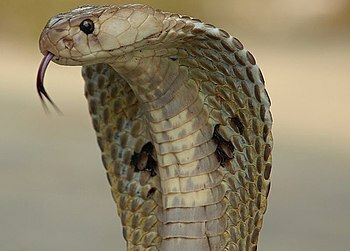 I’ve taken time to learn about snakes and have new respect both for their place in our eco-system and their symbolism. I still jump when one startles me on the trail, but I no longer dislike snakes. Snakes represent transformation and healing. They are re-created each time they shed their skin. By tapping into snake’s energy you can shed the past and emerge into a fresh, new life. Asclepius, the Greek god of medicine, carried a caduceus, a staff with two snakes wrapped around it. The caduceus has become the symbol of modern physicians. If a snake appears in your dream, be on the lookout for new wisdom, healing and changes ahead. In yoga, snakes represent Kundalini, a Sanskrit word for the sleeping feminine energy thought to be coiled at the base of the spine, waiting to be awakened through asana and meditation. When aroused, Kundalini rises up through the major chakras until it reaches the head, completely transforming the individual along the way. Practicing like a snake in the grass. Practice Bhujangasana, or Cobra pose, to explore the transformative energy of snakes. Lie face down and stretch your legs back, feet hip-width apart, and press the tops of your feet into the floor. Place your hands under your shoulders, fingers spread, and hug your elbows to your sides. Keeping your pelvis pressed into the floor and straightening your arms as you make space to do so, lift your heart. Relax your shoulder blades down your back, draw your lower belly slightly off the floor and lift the top of your sternum. Draw your ears away from your shoulders, lengthening your neck. You can hold Cobra for a number of breaths or experience snake’s movement by rising with each inhale and lowering with each exhale. When the pose feels complete, rest your head on your hands for a few breaths before moving on to a twist. For the record, although I have made peace with snakes, there are no pet snakes in my house. I’ll stick to my bug-eating lizard, and let the cat deal with the rodents.